(Medical Xpress)—As occurred in the painstaking deciphering of Egyptian hieroglyphs, adherence to outmoded ideas is a lasting impediment to our understanding of how odorants are decoded by the olfactory system. The primary roadblock for hieroglyphs was the insistence that they were purely ideographic, ie. that the shapes of the pictograms owned all their meaning. It was only after Thomas Young compared the three different scripts of the Rosetta Stone that he was able to discover that the hieroglyphs also had a corresponding physics—namely, that they had phonetics. In other words, it was the relationships found among the previously unappreciated vibrational characters of the spoken glyphs that led to their eventual successful decoding. Using Young's phonetic foundation, Jean-Francois Champollion theorized that there should be instances where certain sounds, like that of the letter 't', come to be represented by more than one hieroglyph, much like our own 'c' and 'k'. What finally convinced the world that it must be so began with a key sound element that Champollion fortuitously discovered in the glyphs for both Ptolemy and Cleopatra. Luca Turin has almost single-handedly created the field of olfactory molecular vibrations. Functional groups of sulfur and borane were his Ptolemy and Cleopatra. 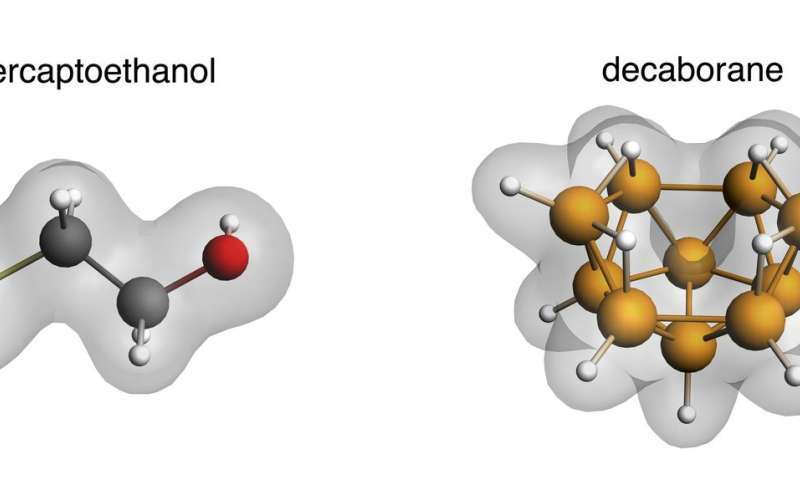 The common note shared by two very differently shaped odorants containing these molecules was one particular stretch vibration occurring at a frequency of roughly 2600 cm-1. With this first key, originally pointed out in 1912, Turin has begun to unlock a whole codex of scents. His latest work, just published with Makis Skoulakis and Klio Maniati from the Fleming Institute and University of Athens in the journal eNeuro, is a game changer in the vibration story. I say "game changer" because traditionally, one way for budding researchers to get ahead in the shapist-dominated field of olfaction has been to take take a potshot at Turin's theories. Often this has been under the auspices of dubious peer review and editorial standards. As with many things these days, the typical result is that #fakenews headlines like 'Vibration Theory is Totally Implausible' get the prime airtime but only rarely does the rebuttal. "In a shape theory, the smell of an odorant is encoded in the shape of the odorant molecule, which in turn determines the receptors in which it fits. This is a lock-and-key theory, therefore the shapes of both locks and keys matter to the pattern of receptor activation. Picture a thought experiment in which the shapes of the olfactory receptor binding sites are all altered, while leaving wiring to the brain identical. The receptor activation pattern will be different, therefore odorants will be perceived to have a different smell, or odor character. In a vibration theory, the smell of an odorant is encoded in the molecular vibrations of the odorant itself. The large number of smell receptors present is there to make sure that enough of them bind any given odorant so that relevant bands of the odorant's vibrational spectrum are probed, as in color vision. Now do the same thought experiment and change the shape of all receptors. Odorants will now also bind to a different set of receptors, but if there are enough of them in each band binding the odorants, the spectrum bands will be correctly measured and the odor will remain the same. This is a fundamental difference, which could experimentally test the correctness of one or the other theory. Altering the binding sites of all receptors is not possible at the moment, not least because we do not exactly know where odorants bind. However, we can ask whether animals endowed with receptors of completely different shapes perceive odorants in a similar fashion. Insect odorant receptors, for example are completely different from mammalian ones: they have no sequence homology, and a different topology. Do fruit flies smell things the way we do? Which odorants should be used to test this? To keep things simple and reduce the problem to a single vibrational band, we have made use of two remarkable observations taken from human olfaction. (1) One of the most remarkable coincidences in olfaction is that both sulfur and boron hydrides (respectively known a thiols and boranes) —and nothing else in nature— smell sulfuraceous to us despite having no chemical properties in common. What they do have in common, however, is a stretch (B-H vs S-H) vibrational frequency, around 2600 cm-1. Do flies, like us, then perceive boranes to smell like sulfur? Our experiments show that the answer appears to be Yes: flies trained to avoid boranes then avoid thiols and vice versa. This suggests that they are detecting a vibration at the same frequency. (2) A second experiment involves the intensity, rather than the frequency of a vibration. It is well known that in cyanohydrins, chemical structures in which a nitrile (-CN) and a hydroxyl (-OH) group are attached to the same carbon, the distinctive CN stretch vibration shows up very weakly in spectrometers. Interestingly, cyanohydrins also lack the distinctive "nitrilic" odor character imparted to any odorant by the -CN group. If the -OH group is moved one carbon away, both the -CN vibration intensity and the -CN odor are restored. We have tested how flies trained to avoid a nitrile respond to a cyanohydrin and its displaced congener. Our results show that they, like us, do not perceive the nitrile in cyanohydrins but do perceive it when the -OH is moved." Green fluorescent protein (GFP), for example, possesses an all-natural endogenous fluorescence without need for any auxiliary cofactor. Instead, an intrinsic covalently-bonded chromophore is spontaneously constructed from the side chains of the tripeptide Ser65-Tyr66-Gly67. Although other kinds of biofluorescent molecules (like luciferin) can be slightly tuned by the surrounding enzymatic shell, there is huge power in directly exposing the full lumiphore construction to evolutionary sequence adjustments; GFPs of every shade, lifetime, activation or quenching ability are available to mother nature and researcher alike. In order to make a tunneling receptor work, the authors suggest three main structural features should be present: provisions for electron transfer across the odorant binding site, for resupply of electrons to the electron donor site, and for electrochemical transduction of the current. By starting with the presumed ancestor of all GPCRs, rhodopsin, they have already found evidence of these features in other members of the receptor family. One particular conserved tryptophan in the receptor binding pockets fits the bill nicely as it has the higher possible 'HOMO' energy of all amino acids. An acceptor with a 'LUMO' energy below that would be possible if metal ions like zinc can be coordinated nearby. Turin mentioned above that insect olfactory receptors are quite different from mammalian receptors. This raises an important question. While mammals use GPCRs that indirectly modify downstream ion channels, insects have opted for heteromeric ionotropic receptor complexes that are gated directly by odorant binding. Insects apparently have ample evolutionary access to GPRCs because they readily employ them elsewhere in their bodies. Therefore, it's perhaps not so much that insects can't use GPCRs for olfaction, but rather that they have chosen not to. Why? Even more beguiling is the devilish conundrum of how nature seems able to convergently muster up different solutions to the same problem of optimally detecting odorants, i.e., receptors with vastly different footprints that use conserved vibrational mechanisms. Perhaps one surprising answer to the issue of ionotropic receptors is that flying insects simply don't have any time to spare on elaborate second messenger mechanisms. While one might imagine that a moth or butterfly casually meandering up an odor plume should not be constrained by synaptic delays of just a few milliseconds, the reality for smaller flies might be much different. Central pattern generators were discovered in locusts as the main control systems behind their ballistic aerial jaunts. Flies, however, must employ a direct stretch-activated myogenic flight control because there is no way that spiking motor neurons can match their rapidly beating wings one-for-one. Researchers have found that just a few spikes in a single fruit fly ORN neuron are sufficient to trigger an upwind turn with a delay of less than 85 ms. At a 200 hz wing beat frequency, a typical turn requires the power of about 10 strokes, or roughly 50 ms. These times are not that much slower than those of fighter aces like blowflies that can pull turns to a visual stimulus in under 30 ms. In 30 ms, these flies might put out just three or four spikes across a single synaptic delay between sensing a looming stimulus and effecting a motor response away from it. The task the flies needed to perform for the 85ms odorant response were actually a bit more challenging then it might at first appear. The flies had to make an olfactory discrimination about the identity of the odorant, and then command a new heading in its direction. Like olfactory neurons, the photoreceptors of flies are also a bit different from ours. Although flies similarly use a G protein coupled second messenger system in their phototransduction cacade, their version takes less than 20ms to go from photon excitation to cell depolarization. Among the fastest known, fly photoreceptor signal chains involve direct physical perturbations of the membrane that propagate through the cell. While receptor and synaptic events might appear to be extremely fast relative to typical axonal transmission delays found for mammalian brains, fly receptor potentials don't typically don't need to be transmitted very far. In fact, in cases where we might say fast computation 'entirely by chemisty' predominates, graded potentials carry the load and spike generation can be dispensed with altogether. In Turin's second point above, he describes how the both the 'nitrilic' -CN spectral line intensity and its associated odor character can be restored by moving an OH group one spot further down the hydrocarbon chain of the molecule. As this was observed in both mammal and insect, one would suspect their receptors and higher order glomerular circuitry might be doing something similar. Another example where a minor tweak to an odorant molecule can predictably (at least in the vibrational world) result in large perceptual differences was highlighted last week in Phys.org. The molecule in question is now believed to be responsible for the strong metalic scent of blood. Known as trans-4,5-epoxy-(E)-2-decenal, or E2D for short, this lipid by-product is created when fats in whole blood break down upon exposure to oxygen in the air. Mice and humans, who can detect E2D at concentrations of less than one part per trillion, show a strong avoidance response to it. Flies, on the other hand, love it, and wolves react like it was catnip. Fully availing myself of the powers of Google in order to sound smart, I asked Turin on social media why trans-4,5-epoxy-alk-(E)-2-enals smell metallic rather than the grassy odor of the associated aldehydes 6 carbons or the soapy-citrus for those with 8? He immediately fired back that this phenomenon can be explained by the dilution of the 1100 cm-1 C-O-C asymmetric stretch. Although there is nothing comparable to this kind of insight into the molecular world of scent within the shapist mentality, we should probably thank its supporters for making this battle of ideas so epic. There may yet be time for two more big events in the field, one a Nobel party, and the other, a funeral.